Eventually, we all face the need to have the furniture reupholstered. This includes cushioned furniture that only needs some upholstery change. Habit is second nature. If you are used to your sofa, which is already quite worn out, and there is no way you are going to trade it for a new one, there is no better option than to replace the upholstery. 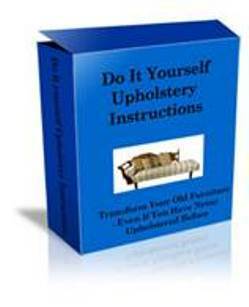 Reupholstering a sofa is not really hard; it only requires a responsible attitude and following certain rules from the Do It Yourself Upholstery Instructions book. By the way, this course can make you a skillful master in changing the old furniture upholstery for the new one. The manual is full of useful advice and competent illustrations. Any old thing can be renovated and modernized. However, in some cases one risks only making things worse. This is true about reupholstering a sofa as well. It is better to avoid replacing upholstery yourself if furniture has a complex design or if you risk assembling it incorrectly after reupholstering. It is not worth taking a chance either, when the upholstery has elements of peculiar configuration, since you will have to make precisely the same ones from the new material. If furniture and the upholstery material you have chosen are both expensive, it would be better to contact a specialist, otherwise you risk becoming a cheapskate who pays twice. If you face none of the previously mentioned difficulties, be patient and get all the necessary tools. Before you start reupholstering, make sure that the couch frame, its soft filling and springs are intact. If something is out of order, first take care of fixing the flaw. If a couch or an armchair has wheels, it is necessary to install new wheel bearings or to replace them entirely with more reliable metal legs.